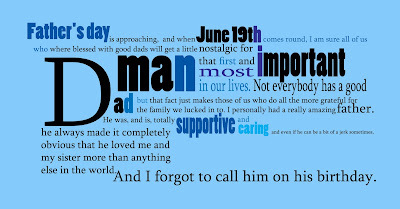 Father's day is approaching, And on june 19th, I am sure all of us who where blessed with good dads will get a little nostalgic for that first and most important man in our lives. Not everybody has a good dad, but that fact just makes those of us who do all the more grateful for the family we lucked in to. I personally had a really amazing father. He was, and is, totally supportive and caring, and even if he can be a bit of a jerk sometimes, he always made it completely obvious that he loved me and my sister more than anything else in the world. And I forgot to call him on his birthday. This is the thing about fathers. Somehow, even though they know you love them, and you know it means so much to them, they seem to rarely ever get told it. Maybe because they are men, and men are supposed to be less demonstrative than women, we think it would be better for these things to rem ain unspoken. No mater how much we think something is understood, however, it is always good to let someone know for sure how special and important they are to us. It seems like we never forget Mom. We send her flowers or a gift, or at least a phone. We will never forget mothers day, because we are reminded months in advance. It is estimated that, on a national level, we spend 4.8 billion more on mothers day than on fathers day. Mothers are important, of course, but so are fathers, but it seems we tell them so less often. This June, maybe it is time to make up for past silences and make sure dad gets the message loud and clear. Loud and clear does not have to mean unsubtle or not beautiful. At Canada on Canvas we can create a personalized canvas print or fine art paper print from any photo you like, so you can give Dad a very personal gift that he will love. Pictures, especially family photos, are records of all of the good times you have had together, and of how far you have come. 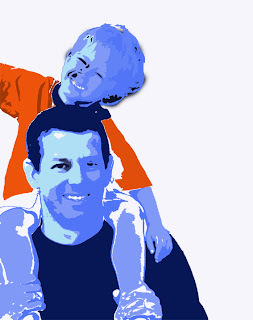 We can create a canvas print from an old family photo, or we can design a custom collage on canvas of pictures from the photo album or of his grand-kids. Photos of the grand-kids are another great gift idea for Dad. His grandchildren are the most precious gift you will ever give him, and seeing their smiling faces will always bring him joy. These do not have to be professional shots. Some of the best photos are candid snapshots that happen to record a special day or moment. Kids tend to make the best subject for candid shots, since they are vary active, and often most adorable at their most infuriating moments (it's their survival tactic). At Canada on Canvas We are starting to offer a new service that we are calling 'Text Art'. It works this way: you send us a text document with the message that you want printed. It could be a collection of memories, A short letter or poem, or a collection of words that express how you feel. Let us know how you want it to look, and we will create a piece of text art to be printed on canvas. We will send you a proof, and if you like what we have done, we will print it for you! Any text can be made into art. I have created two examples using the text of this blog post! 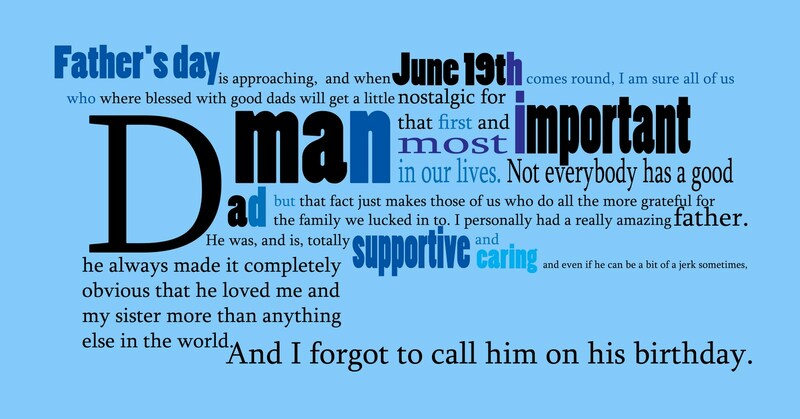 You know what dad would like best, Just be sure not to forget him on June 19th, Father's day.